Manpreet Bambra plays Jade on Free Rein. Manpreet Bambra stars as Jade in a Netflix show called Free Rein, which premiered its second season on July 6th. For those that have not seen the show, I highly suggest watching! 1. For those that are unfamiliar with Free Rein, can you tell us what it is about? 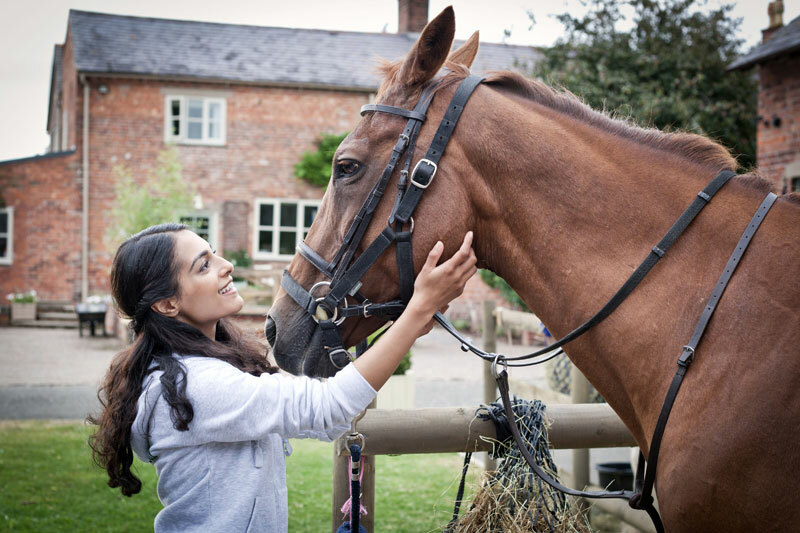 Free Rein is a show based on a young girl called Zoe and her family from the US visiting the UK, where she finds herself connected to a horse called Raven. The show follows on topics including: horse riding, friendships, love triangles and competitions. A show full of drama, fun and adventure. 2. Did you have any experience with horses before Free Rein? Before Free Rein I had only minimal experiences with horses and horse riding. I had attended a few classes when I was 16 but I didn’t starting filming first season of Free Rein until I was 24, so had forgotten a lot. 3. Tell us about the horse that you rode. The horse I rode in the first season I found really difficult to train on, as we just didn’t have a connection. I struggled a lot. But second season I was introduced to a new horse and we connected straight away. I felt like I’ve improved so much, constantly learning something new every day. I felt safe and comfortable with him, which is so important. It worked well for the storyline this year as I am a shy, quiet person in real life. So horse riding and improving my skills, has really helped me with my confidence actually. I love it. 4. What did you enjoy most about working with horses? I enjoyed the riding the most, but also connecting with the horses themselves. They’re such intelligent animals. So beautiful. The horses we get to work with are so talented. They are all so different and individual. 5. What was the most difficult scene to film on Free Rein? The most difficult scene would be scenes at the beach, as we are having a summer gathering in a freezing cold beach! It’s actually quite funny because we are all cold and then when we hear ‘action’ we automatically stop shivering. It’s hilarious. The beach looks amazing so definitely worth the cold days. 6. On the other hand, what was your most enjoyable scene to film? Most enjoyable scene would be me having to sing/rap and dance. I was petrified to do this in front of an audience. I’ve never sung in front of others or danced. But at the same time I really enjoyed learning something new and coming out of my comfort zone. It ended up being so much fun. Kerry (Becky) and I got to wear fun costumes and learnt a dance move. It’s been great fun. 7. Do you have any funny behind the scenes stories to share? Funny behind the scenes stories would be when we sometimes mess our lines up and can’t help but giggle. When one of us has the giggles I suppose it’s like a chain reaction we all can’t stop laughing then. An example is I had to walk into a tent but hit my head on the pole and tried to carry on after saying “ow” loudly and couldn’t help but burst into laughter and then Kerry started laughing and so did everyone else. 8. How did you get into acting? I got into acting when I was 14. I attended extra LAMDA examination classes at school. Then one day there was an open audition for a CBBC show called M.I. High. I auditioned for a round of 12 times and got to the last 2. I didn’t get the role but the casting director recommended an agent for me and from there I started to attend more auditions for further big projects. 9. Would you work with horses again if you have a chance? If so, are there any specific films or productions you’d like to work on? I would love to work with horses again if I got the chance. I would love to learn to do stunts on a horse. For example a warrior/battle film would be cool. 10. Do you have any upcoming projects to share? Earlier this year I finished shooting a feature horror film called Ravers, which will be released in 2019 but previewing at London Fright Fest in 2018. Keep an eye out.